Wartburg is named after the Wartburg Castle in Eisenach, Germany, a center for culture and the arts since the 11th century. The castle became a significant landmark in Lutheran history during the 16th century Reformation. While under a papal ban and disguised as a knight, Martin Luther spent 10 months in hiding at the castle. During that time, he completed a translation of the New Testament into German. Considered one of Luther’s greatest achievements, this translation became the standard for a uniform written language throughout Germany. Sir Victor is the school mascot and cheers the Knights to victory. Duane Schroeder ’58, long-time sports information director, was the creator of the original Sir Victor in the 1960s. The name Victor comes from the word “victory,” which is something Wartburg knows a lot about on the field, on stage, and in the classroom. Wartburg students and alumni are considered to be knights. All first-year students are “knighted” by the president and other leaders of the college during orientation weekend. The college’s castle heritage is evident in many traditions. The Saemann Student Center has the Hagemann Castle Room for special events, and the student cafeteria is called the Mensa, a German word for university cafeteria. The Vogel Library coffee shop also has a German name, the Konditorei. Vocal music groups include the Castle Singers and the Ritterchor (Knights Choir). Meistersinger Music Scholarships and music festivals are named for medieval singing competitions held at the Wartburg Castle. 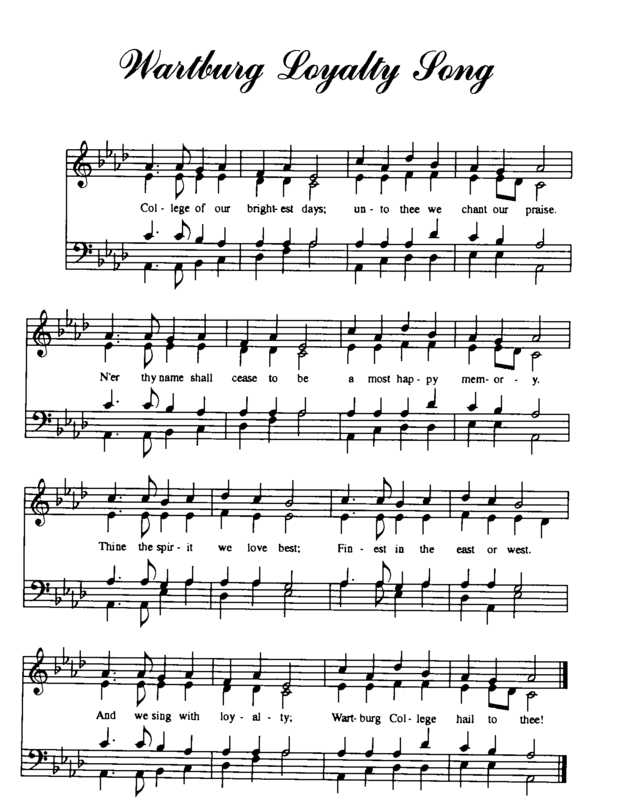 School Songs – U RAH RAH RAH! 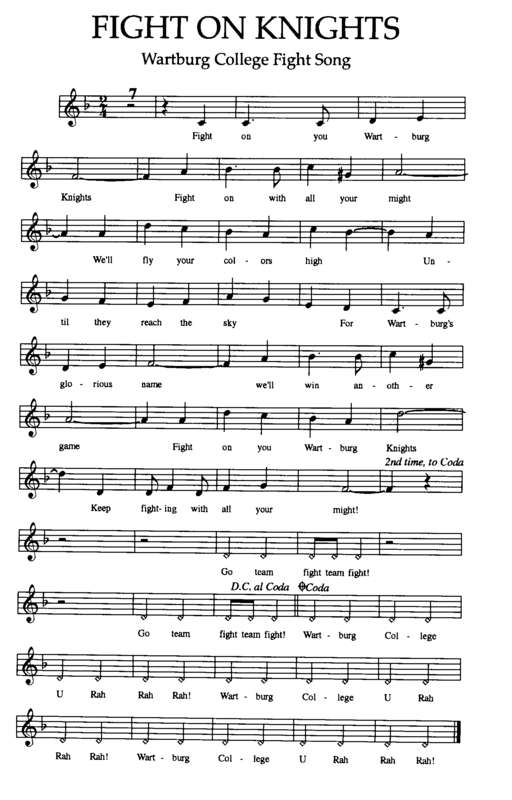 The college fight song was written by a 1950 alumnus, the late Robert Dotzauer and is sung at all sporting events. The Wartburg Loyalty Song is the college alma mater and is sung at all major concert events. Sometimes called by its German name, "Ausflug," Outfly is a student-initiated, one-day holiday. This Wartburg tradition traces back to the 1890s. It now occurs once a year during the Fall Term. Outfly is called upon a date known only to the college president and the student body president. Evening classes on Outfly are not cancelled. Since the 1950s Wartburg College and Luther College in Decorah have celebrated a friendly rivalry that has produced some legendary spectacles over the years. One such event actually lead to Rolling Stone Magazine listing it as one of the best college pranks of the year. Weekday Chapel is each Monday, Wednesday, and Friday in the chapel from 10:15-10:35 a.m. It is led by the campus pastors, and messages are given by students, faculty, staff, pastors, and invited guests. Sunday morning worship at 10:30 a.m. The Victory Bell, near Walston-Hoover Stadium, came from Clinton, Iowa, the site of Wartburg College from 1894 to 1935. It had been in storage on the Waverly campus until 1984, when the Student Senate provided funds to mount it. Victory Bell Plaza was completed in 2001 as part of Walston-Hoover Stadium. The victory bell is rung after every win. Only the student body and college presidents know the date. Students gather at the victory bell in the morning when "Outfly" is declared. Classes are cancelled and fun activities are planned throughout the day. GETTING A SURPRISE DAY OFF FROM CLASSES. WORTH IT.